" In August 1914, Raymond Brutinel, a French immigrant who had come to Alberta in 1905 and made a fortune in mining and other commercial ventures, was a millionaire living in Montreal. As a French army reserve officer, he had kept informed of developments in military sciences and was convinced that machine guns would be of great importance in the coming war. Indeed, he planned to rejoin the French army with a large shipment of Colt machine guns that he had purchased. When Clifford Sifton, a former federal cabinet minister, heard of this scheme, he convinced Brutinel to implement his plan with the Canadian army preparing its first overseas contingent. Sam Hughes and the government accepted the proposal. 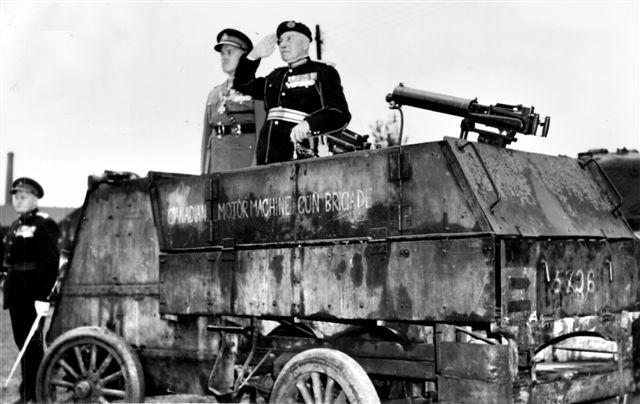 Thanks to Brutinel's frantic efforts, 8 armoured cars (vehicles specially constructed in the United States to his specifications) and some 20 Colt machine guns were delivered to the Canadian army. 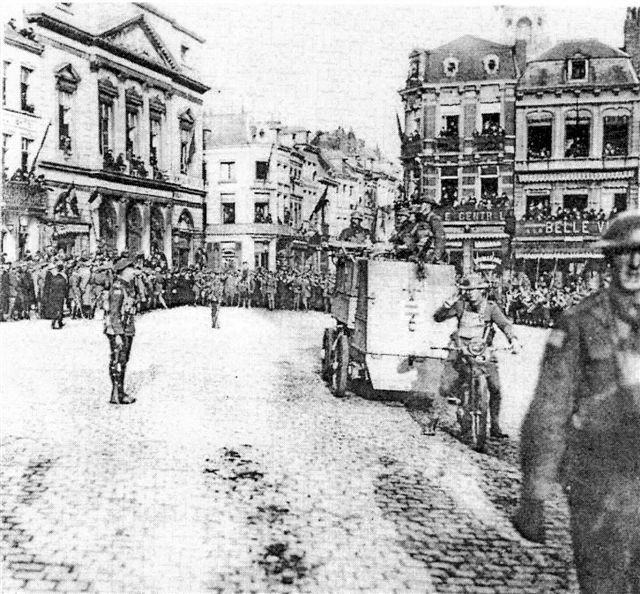 On 9 September 1914, the brigade included 2 batteries, 9 officers 115 men, 8 armoured cars, 8 trucks, 4 automobiles, 17 motorcycles, 16 bicycles and 20 machine guns. The brigade, since it possessed its own transport and mechanics, was logistically self-sufficient. It was the first totally mechanized military unit in the British Empire. Better even than the tank units that were created later in the war, it is the true precursor of the mechanized armoured units that became the norm by the Second World War. 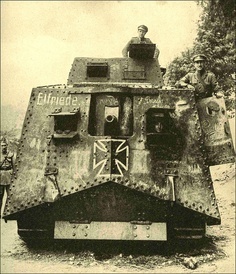 In many ways, it was one of the earliest armoured units, combining mobility, protection, and communications with firepower and can lay claim to being the first armoured unit in the Commonwealth. Although many British and Canadian commanders were reluctant to see the value of this mechanized unit, its mobility and firepower were, on several occasions, put to good use in securing gaps in the line. 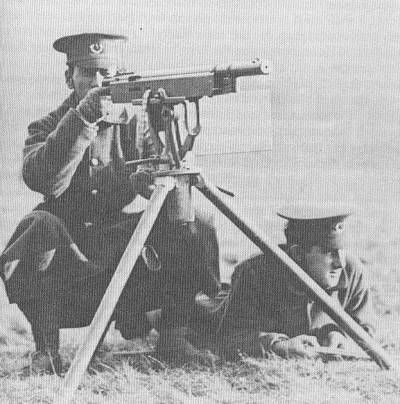 In 1914, most European infantry battalions had four machine guns whereas British units were equipped with only two. Canadian battalions generally went overseas with four, and, in many cases, the additional guns were purchased with locally raised funds. Canada's machine gun organization expanded quickly and continued to grow until the last days of the war. In 1916, Brutinel's brigade was renamed the 1st Canadian Motor Machine Gun Brigade. This occurred when the original brigade of two batteries absorbed three other armoured car machine gun batteries. (Philanthropists had also raised these batteries.) The new brigade became the centre of excellence of machine gunnery in the Canadian Corps. Soon after arriving in England, the brigade, having discovered that Brutinel was a superb instructor as well as a great organizer, was teaching battalion machine gunners in machine gunnery. Under Brutinels' supervision, the Canadian Corps eventually formed machine gun companies at both the divisional and brigade level. Brutinel, originally in charge only of the machine guns of the 1st Division, gradually was given control over all machine gun organizations. Indeed, by 1918, he had been promoted to Brigadier and held the position of Commander Canadian Machine Gun Corps. Machine gun organizations at all levels of the Canadian Corps were continually expanded and upgraded until the last days of the war. Brutinel developed new techniques for shooting machine gun barrage targets by predicting machine gun indirect fire in exactly the same manner as artillery: plotting elevation and azimuth using ammunition firing tables and indirect fire. " 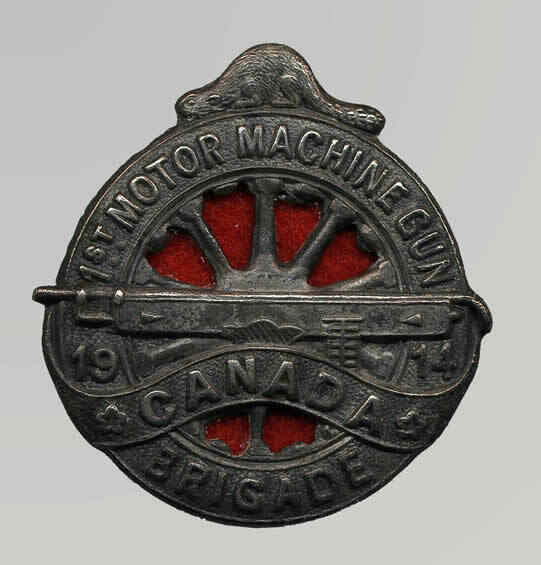 Collar badge of the 1st Canadian Motor Machine Gun Brigade, ' Brutinel's Brigade ', the badge shows a ' Colt ' machine gun originally fitted to their ' Autocar ' Armoured Cars, this machine gun being replaced in August 1916, by the Vickers machine gun. Thanks for all the info LF. It makes you realize just how brave those men were going into action in those vehicles, although they had some armour protection, there was also a lot of exposure to enemy fire, and we can see the tragic results in post # 566.
' the Autocar Armoured Car ran on four solid rubber tyres, and could reach a speed of 40 mph. 40mph! That is a bit optimistic. 14mph more like. 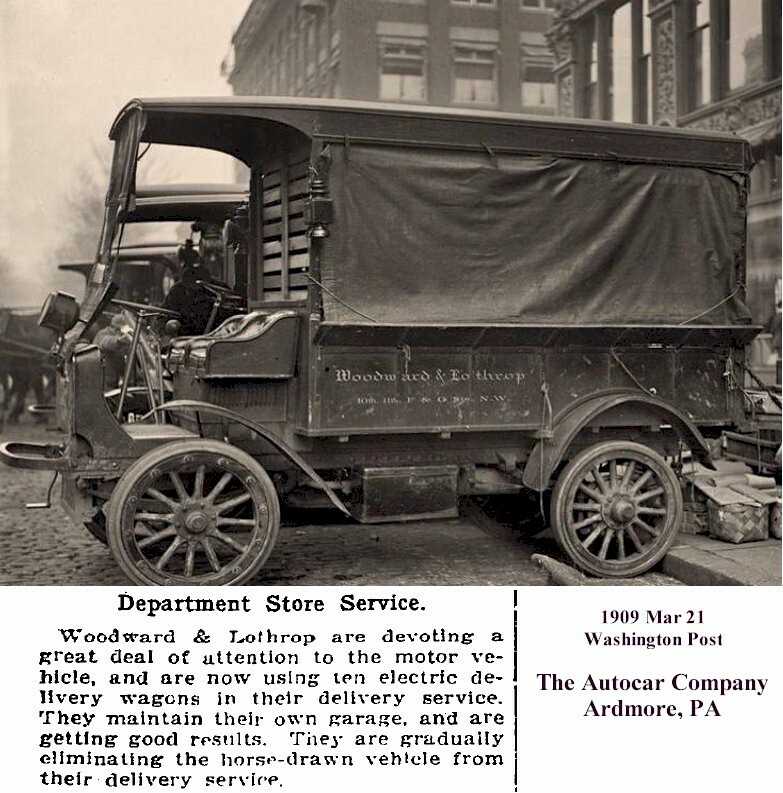 That speed quote, came from a WW1 period Canadian newspaper article reporting on the then ' new ' Autocar Armoured Car. It seems that their 40 mph., is too high, and your 14 mph., is too low, and what that newpaper article probably meant to say was 40 kph., and not 40 mph, as that seems to be the correct speed attributed to the Autocar Armoured Car, or 25 mph., making it somewhat slower than the Lancaster A.C. - 60 kph., or the German Erhardt - 60 kph. 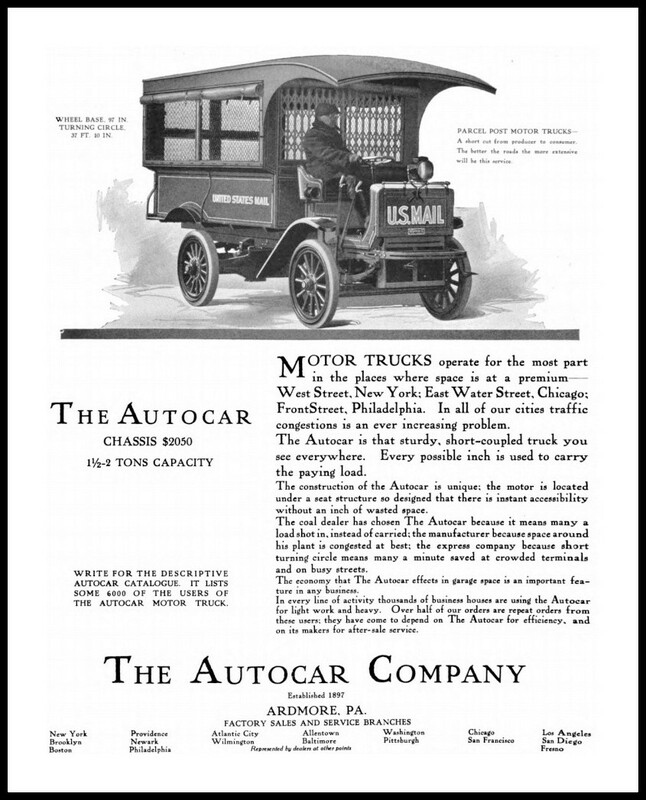 The ' Autocar ' Armoured Cars were made by The Autocar Company of Ardmore, Pennsylvania, U.S.A., for the Canadian Army, and from this advertisement for their vehicles, we can see some features used on the ' Autocar ' Armoured Car. Even 25mph sounds rather fast to me. The reason being is that the solid tyres will not take that sort of speed and will blow themselves apart. Drivers orders stated the top maximum speed of lorry’s to be 10mph. Pneumatics could cope with faster speeds but I wouldn’t think that an Autocar especially covered with armour plate would get near 25mph. We do have the model Autocar UF21 in our collection of WW1 trucks. Ours though is one of the 265 which served in France as water tankers by the wars end. As we didn’t have the water tank to put on it we restored it with a wooden GS body and as one of 189 which served in East Africa during the war. It is great fun and a very reliable starter. You can leave it for 12 Months then swing the handle and it will fire up (although making a big cloud of smoke). These photographs are copyright of the Imperial War Museum and are published here with their permission under their non-commercial licence. This is one of the unarmoured Canadian Autocars which had the “command car” type body removed and replaced with a GS type body. This is how the Autocar looked shortly after purchase. It had come back from France after the last owner died. It had been in regular use as a coal lorry in Cambrai up until 1957. It was still covered in coal dust. The chassis had been broken into two no doubt from overloading. A second chassis and a cart body had been bolted on to it. That is a second engine on top. We had it running shortly after it arrived. The engine is two cylinder horizontally opposed and the cylinders had worn into ovals. Anyway, here it is after a full rebuild. Using the wonders of modern technology if you click on this photo you should see it progressing at a hairy speed. Excellent photographs, and another wonderful restoration job, so nice to see these old vehicles back on the road in their original condition. Canadian Maj. Gen F.F. Worthington taking the salute at Camp Borden in 1956, standing in the same ' Autocar ' armoured car he used in WWI as a lieutenant with Brutinel's Motor Machine Gun Brigade. 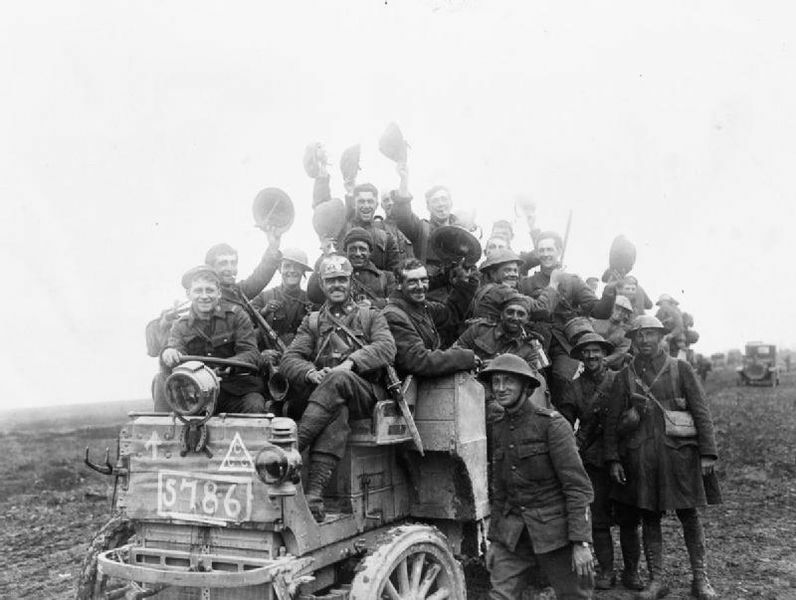 Autocar Armoured Car and troops of the 1st Canadian Motor Machine Gun Brigade in Amiens, August 1918. Canadian troops, some having war trophies, with their Autocar UF21 30 cwt. GS Wagon at Flers-Courcelette, 1916. 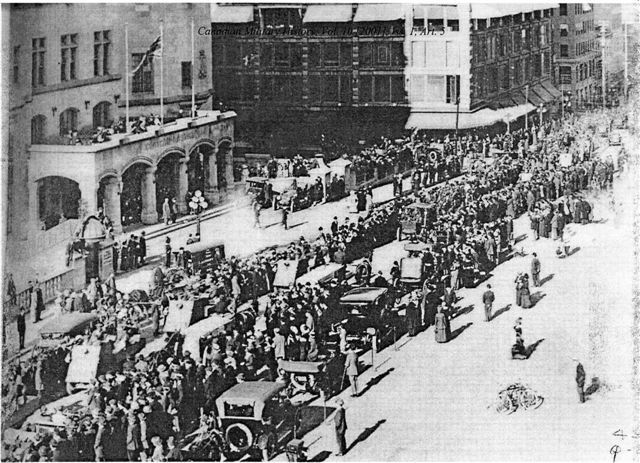 Autocar Armoured Cars of Brutinel's Motor Machine Gun Brigade parade down Rideau Street, Ottawa on 23rd September 1914, prior to being loaded onto flatcars at the railway station to be taken to Montreal, where they were then loaded onto a ship for transportation to England before being sent to the Western Front. Pleased you are enjoying the Thread. 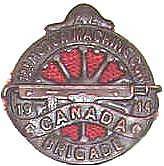 The badge of the 1st Canadian Motor Machine Gun Brigade consists of a Beaver sitting atop a motor wheel, with a Colt/Browning Model 1914 Machine Gun placed horizontally across the middle of the badge. Originally, the Autocar Armoured Cars of the Brigade, were equipped with Colt/Browing machine guns, and then in August 1916, these were replaced by Vickers machine guns. 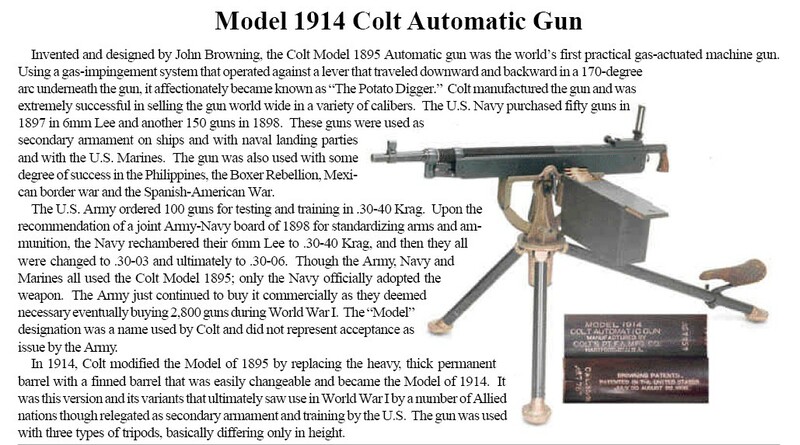 Colt/Browning machine gun as shown on the badge. Model 1914 Colt/Browning Machine Gun, and Colt Machine Guns in an Autocar Armoured Car, prior to their being replaced by Vickers in August, 1916. Canadian troops with the Colt/Browning machine gun. 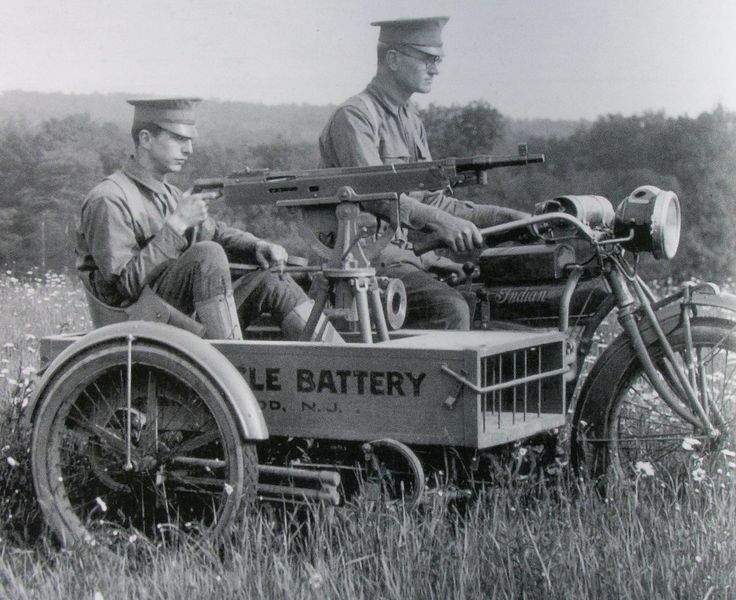 American soldiers ( Motorcycle Battery - New Jersey ), with their Colt/Browning machine gun mounted on an ' Indian ' motorcycle combination. 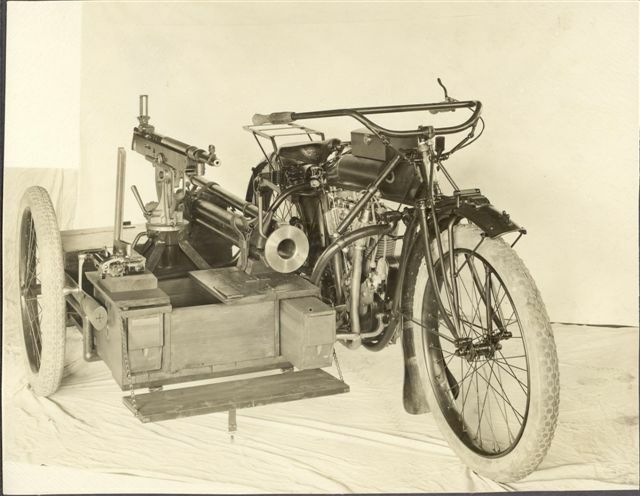 Another motorcylce mounted Colt/Browning machine gun.